VoIP Radio provides a complete digital communications solution for industrial, safety, medical, scientific, and mobile radio over IP applications using VoIP protocols. Our multi-channel design enables cost effective low power VoIP radio communications for use in hazardous environments. The portable ARM based design is available for processors from TI, ADI and other leading vendors. VOCAL VoIP radio software may be licensed as a library or part of our complete reference design. Custom solutions are also available. Contact us to discuss your VoIP radio application. VoIP Radio is a method of communications that enables digital two-way radios to interconnect using Voice over IP protocols over radio, satellite (Iridium, etc) and other networks. A VoIP enabled radio converts voiceband audio to digital data suitable for transport over an IP network. VoIP radio enables point-to-point and multi-point voice and data communications over existing RF channels. This technology offers numerous advantages to both existing radio networks as well as new communications systems under development. Increase the number of channels on an existing network. VoIP enabled radios support multiple data streams for both voice and data communications over a physical RF link. Use VoIP services. VoIP enabled radios can connect with the Internet and access service providers to communicate directly with mobile devices or landline telephones. Interoperability with other networks. VoIP enabled radios can communicate with each other directly over the Internet and to other radios via an VoIP gateway. 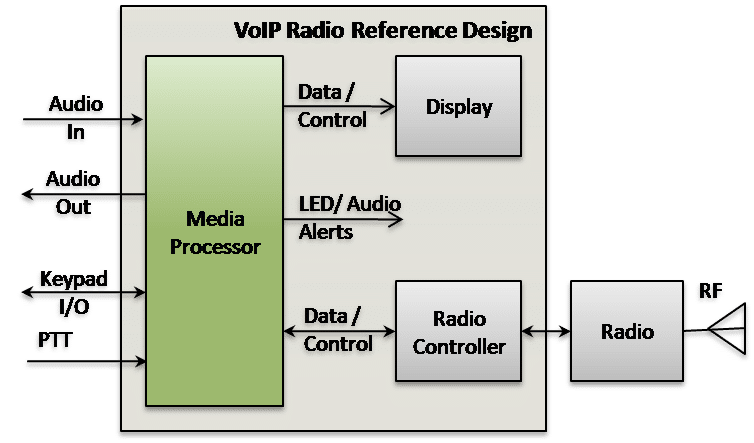 VOCAL VoIP radio software provides application developers a highly configurable multi-channel framework with VoIP stack, jitter control, RTP, along with other networking protocols. In addition, our full-featured Voice Quality Enhancement software provides a wide range of voice compression algorithms including MELPe, G.711, G.722, Speex, etc. as well as robust echo cancellation and noise reduction algorithms. When combined with SRTP, SDES, IPsec and encryption, VOCAL radio software provides a comprehensive digital radio solution that can ensure secure communications with superior voice quality in the most challenging of environments.